Alright, I'm finally ready to admit it - it's cold outside. I'm not quite sure I'd say uncomfortable yet, but cold it is. The other night, after a long day's work, it was time for another fairly tired 3am trudge back to the station. I hadn't really noticed, but since the weather cleared a couple of days ago, the temperature has been dropping like a stone. The windchill on the walk back was under -100F, and for the first time since I got here - probably in part because I was tired - I got a little bit cold in Big Red (the traditional name for the large red parka you're given to wear down here). 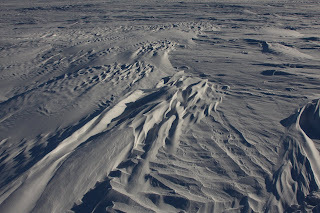 Most of that cold came from the high winds, which, in addition to being cold, make amazing patterns in snow drifts. The ground was carpeted in what looked to be streams or rivers of blowing snow. They flowed and swirled, always keeping low, within a couple of inches of ground level. It made for a mesmerizing show, and a couple of times I had to stop to watch the snow dancing. As always, things here are an amazing blend of harsh and beautiful.